I'm taking a few weeks to makeover The Trendologist. Thanks to everyone for reading the blog and you'll be hearing from me soon! Time Out New York had a very special surprise this week. British songster Ed Sheeran came to our office and serenaded us. A nice mid-day concert, yes? Ed seemed super nice and is quite talented! No matter how old I get or how my personal style changes, I will always have a soft spot for quirky, unapologetic fashionistas. That's exactly what Aureta Tautou is. I truly admire her ability to defy typical fashion rules and adhere to her individuality. If there's anything more inspiring than unapologetic individuality, please let me know. Emma Stone at The Amazing Spiderman press event in Moscow (Lanvin): There are very few people who were made to wear a particular designer. So I'm really not exaggerating when I say that Emma Stone was made to wear Lanvin. Not only did she grace the Met Ball red carpet with Lanvin genius Alber Elbaz, Stone looks absolutely stunning in this yellow number. The solid black pumps create this mysterious, Parisian allure. The sophisticated updo and dainty earrings are lovely finishing touches. J'adore. Chloe Grace Moretz at the Max Mara cocktail party: The sophisticated sheath plus the poppy turquoise hue equals pure perfection. I also adore that pop of yellow on her shoes- the simple dash of color makes this ensemble so youthful and fun. Her luxe hair and minimal jewels creates this understated 70's aesthetic. Lea Michele at the Chrysalis Butterfly Ball (Pucci): When's a better time to ace boho chic than the summer? Is it just me or is there something terribly bohemian about the summer in general? The backless gown plus the ethereal print is quintessential summer. Obviously, I'm crazy about the bright coral lip- so glamourous! As much as I love teeny pop beats, I really do hate this song. Also, those grunts are pretty scary. However, I must admit this jam is trendy. Do me a favor: listen to this song and let me know if you can get it of your head. I personally cannot. Give me a week and I'll probably be addicted. This weekend, I fostered a mild obsession for the Kennedy family. 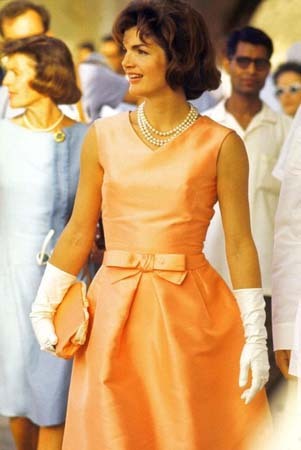 Not only was Jackie O a strong individual, but everyone is enamored with her style. To put it bluntly, she paved the way for 60's style. It's about time I give her the praise she deserves, don't you think? Dakota Fanning at the American Film Institute (Gucci): Remember when Dakota Fanning was only 8 years old? You know, when she starred alongside Brittany Murphy in Uptown Girls. It's crazy to think that this former child star is just as relevant, not to mention super stylish, today. Everything about coral number is perfect: the subtle two-tone combination, the classic silhouette, the punchy black belt, and the modest V-neck work to create a cohesive look. This ensemble marks a perfect transition from Fanning's childhood style to a mature future. The simple accessories, hair, and makeup subdue the shocking coral. Zoe Saldana at the CFDA Awards (Prabal Gurung): Let's be honest: anything that brings Zoe Saldana and Prabal Gurung together is automatically deemed brilliant. The super sleek hair as well as the "notice me" sheer accents create a sultry chic ensemble. Additionally, I can never resist a long-sleeved dress! Fergie at the amFAR Inspiration Gala (Calvin Klein Collection): Do you remember that last time we saw Fergie look this classy? I sure don't! From her old Hollywood ringlets to the way her stylist assembled the black, proliferated dress, Fergie looks like a class act. Fergie finishes off this look with demure pumps and effortless makeup. Though she's dressing for the event, Fergie is looking more modest than usual. I must say it works for her! If there are two things I'm disgustingly obsessed with, it's Russell Brand and Fun. As we all know by now, Fun is my favorite band- even before "We Are Young." And let's be honest: who doesn't love Russell Brand? I can happily say that I've read both his memoirs, own his comedy DVD, and cannot wait to see Rock of Ages. 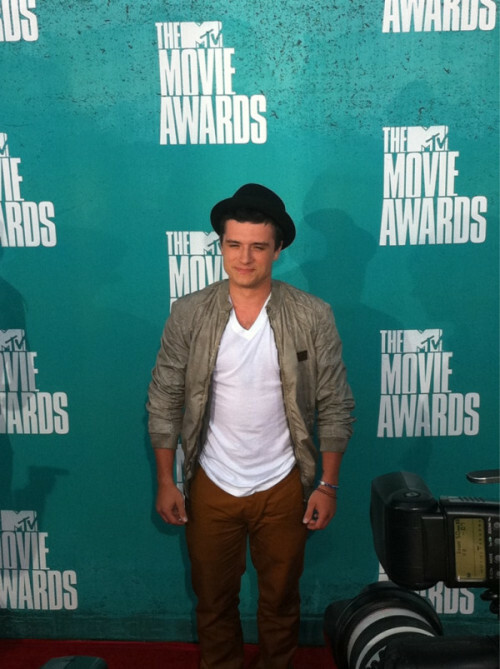 So obviously I was excited for the 2012 MTV Movie Awards. Let me just say that the fashion did not disappoint- there were some stellar looks and horrific ensembles that I couldn't have dreamed of if I tried. Ready for a crash-course in the red carpet? Let's hope you are! If you're in the market for a "song of the summer," look no further! My friend showed me this one and I'm so obsessed. It's perky, inspiring, and so catchy. Tell me this song doesn't want to make you accomplish great things, I dare you. In honor of the Queen's Jubilee, I thought I should dedicate this week's Style Spiration to a fashion-forward Brit. Honestly, who's a better choice than Posh Spice herself? What fashionista doesn't adore this pop sensation turned style maven? Not only is her style clean and chic, but her diva-esque attitude is to die for. Miranda Kerr at the Sydney Airport: How feminine! Kerr rocks a dual-tone trenchcoat with leather accessories and a poppy lip. The supermodel's lack of jewels is perfect for this crisp and proper ensemble. Not only is this ensemble styled beautifully, but I love that she wore this to the airport. So smitten. Alexa Chung at the Royal Academy Summer Exhibition (Moschino): Chung channels her inner Twiggy with this contrastingly feminine ensemble. While the lace detailing, as well as the buttons, infer an exuberantly feminine aesthetic, Chung gives it her own quirky twist with messy hair and a juxtaposed clutch. To top it all off, the black Mary Jane-inspired pumps and the flirty cat eye bring this look back to it's groovy roots. Kate Moss at the Mango Fashion Awards: Quintessential Kate Moss, no? I'm obsessed with her effortless style and this look ties that together with a polish, business-approved twist. If you're hoping to copy this look, it's all about mixing and matching different textures.